Michigan kids and their families are invited to join us at F&M Park in Traverse City for the annual Lids for Kids event. Trained professionals and volunteers will properly fit each child with a free bike helmet and share helpful bicycle safety tips. Children in attendance and wearing their new helmet may also fill out a raffle ticket for entrance into a drawing with tons of prizes and a chance to win a FREE bike! The Traverse City event is sponsored by the Sinas Dramis Law Firm, Brain Injury Association of Michigan, and Agevix Professional Network for Exercise Therapy. 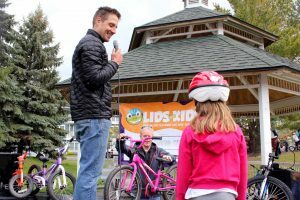 Local partners include Traverse City Area Public Schools, Norte Youth Cycling, McLain Cycle & Fitness, Grand Traverse Woman Magazine, WTCM NewsTalk Radio 580, and Grand Traverse Construction.